CGM, or Computer Graphics Metafile, is a free and open file format for 2D vector graphics, raster graphics, and text. Originally designed and used for clip art libraries, it is now mainly used for CAD drawings. Many countries have adopted CGM as their national standard after it was defined by ISO/IEC 8632 in 1987 and later revised in 1992. CGM is also accepted as a MIME data type. Since CGM is a metafile (a file containing information describing or specifying another file), it can hold a wide range of graphical and geometrical information. As a result, more than being an explicit graphic file, CGM is a file that holds data and instructions for reconstructing graphical images using an object-oriented approach. One of CGM’s main features is that the metafile is set in such a way that besides accessing it sequentially, it is also possible to randomly access individual pictures and individual context-independent application structures with ease. Three different methods are used to encode CGM files - Binary Encoding (a method that allows software programs to read the file quickly and efficiently), Character-Based Encoding (which produces the smallest possible file size, thus saving disk space and allowing faster data transfers), and Clear-Text Encoding (this method allows users to read the contents of the file and modify it using a basic text editor). The CGM file is encoded using one or more methods depending on the purpose of the file. CGM files are supported by many different programs. Among them Adobe Illustrator, IMSI TurboCAD, AutoDesk AutoCAD, CorelDRAW or Paint Shop Pro on Microsoft Windows; and Adobe Illustrator, IMSI TurboCAD, and Apple Works on Mac OS. All these programs open the files directly. 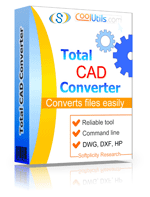 Total CAD Converter can convert CGM files to DXF, WMF, PDF, JPEG, TIFF, PNG to view or share them with ease without special software. Since CGM is not widely supported by web pages, the World Wide Web Consortium has developed WebCGM, a modified version of CGM, to be used on the Web.